▶ Building a Resilient Stream Processor in Go — In 40 minutes, a developer explains how he built a stream processing pipeline system (Benthos) in Go. Well recorded and goes into a lot of depth of the architecture. Go's 'net' Package Doesn't Have Opaque Errors, Just Undocumented Ones — A developer got frustrated with the net package’s general error type (OpError) for easily determining what error had actually occurred, but then discovered there are more elaborate errors to check under the hood. 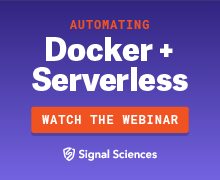 Learn How to Automate an AppSec Pipeline Using Docker and Serverless — With the rise of docker and serverless patterns, there is a whole new suite of tools available to the pipeline builder. In this webinar, learn how to get started automating application security tooling and reporting using these new patterns. go-sqlite-lite: A New SQLite Driver for Go — A neat driver for working with the world’s most deployed database direct from Go. It even supports SQLite’s online backup API and BLOB incremental IO. A Good Makefile for Go — This is a really awesome Makefile for a web application that includes hot reloading and nice help output. I can dig it. My Favorite Go 2.0 Proposals — A quick look at three proposals for Go 2.0 (from a significantly longer list)) such as interface literals and fixing inconsistent casing in function names. Go 1.11 Release Candidate 1 Released — The final release is due any day now. Here are the draft release notes. Mid-level & Senior Backend Go Engineers - North America (Remote) — Help us build & deliver reliable solutions for our clients. We are a high-performance software development firm. Find A Go Job Through Vettery — Vettery specializes in dev roles and is completely free for job seekers. Create a profile to get started. Paperback Edition of 'Writing a Compiler in Go' is Out — We linked to the release of the digital book in #222, but if you prefer real life books, this is great news. Avoiding Concurrency Boilerplate with golang.org/x/sync — A part of a series on the Go sub-repos (golang.org/x/*), the sync subrepository offers some nice abstractions for common concurrency issues. Build a Netflix Style Video Platform - GoLang API Client — Play videos at the same quality and speed as Netflix & YouTube. API clients for all major languages. Face Recognition with Go with go-face — Leveraging the dlib C++ machine learning toolkit to create a face recognition library for Go. Does The Go Race Detector Catch All Data Races? — The answer is “no”, but you probably guessed that. Read this article for an example of how a data race goes undetected. Single Process Programming with Go and SQLite — Based on a presentation at Go Northwest, David discusses the one large VM, one large process approach to programming that is either bizarre or brilliant. Or both. Benthos: A Resilient and Quick-to-Deploy Stream Processor — Connect numerous sources and sinks (e.g. S3, Kafka, RabbitMQ, Redis, and many more) and perform actions, filters, etc. in between. QLBridge: A SQL Expression VM for Building Your Own Query Engines — A SQL execution engine for embedded use as a library for SQL or SQL-Like functionality. Goofys: A High-Performance, POSIX-ish Amazon S3 File System Written in Go — Allows you to mount an S3 bucket as a fileish system. - .... . -.-. .- -.- . .. ... .- .-.. .. .